Grace D'Aprile: Singer/Song-Writer with Music for the Soul | Grand Central Magazine | Your Campus. Your Story. Central Michigan University junior Grace D’Aprile has been singing for as long as she can remember. “I would force my family to sit on the sofa during holidays to sing to them,” she said, reflecting back on her childhood. D’Aprile constantly felt that music was the path she wanted to go on her whole life. Even though people told her music wasn’t something that she could rely on forever, D’Aprile always knew if she pushed herself hard enough she could eventually get there. Around 6th grade she found her uncle’s guitar and asked to keep it, using Youtube to teach herself how to play. She eventually transitioned to learning piano as well. Grace has been writing songs for just as long as she’s been learning how to play music. 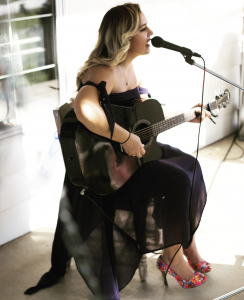 She has looked up to country singers like Miranda Lambert and Maren Morris, enjoying their musical style and presence. “I usually get a topic or title for a song, then I work on the music, then put lyrics to it after,” D’Aprile said. R&B-style country music and ballads are two styles D’Aprile personally aims for when she is composing songs. She always wants to find a melody and chord progression that people are going to find interesting. “I went on Garageband and figured out how to add different instruments to the songs my roommates liked the most,” she said. Over the past few years D’Aprile has performed at many weddings at bars, stretching her wings as an artist. This year D’Aprile experienced a surge of inspiration like no other and wrote 10 songs in one week. “A lot of my songs are about self-love because of what I have experienced during my life,” D’Aprile said. Growing up, D’Aprile struggled with self-confidence, and is constantly faced with new life experiences, as so many students are. She wrote a song called “More Than Enough,” talking about learning to love who you are as a person. Her most recent song “You” was written after her high school friend passed away recently. Music was the way she would build herself up and find closure, using those experiences as inspiration for her music. Another source of inspiration? The guests at her job. D’Aprile balances her music and classwork with working at the Isabella County Restoration House 40 hour a week. At work she will often perform covers and her own songs to all the guests at the shelter. This summer D’Aprile will be in California where she will have opportunities to perform with a friend and their band. After graduation next year, she wants to move down South like her musical influences, singing anywhere and anytime she can. To listen to more of D’Aprile you can find her on SoundCloud for her original music. Separator image Posted in Arts & Entertainment, Music, Music, Pop Culture and tagged with Anna Greenwood, Arts & Entertainment, Grace D'Aprile, Pop Culture, Singer, Song-Writer.